In part 3 of building your own email server on Ubuntu tutorial series, we implemented SPF and DKIM records to improve email deliverability. In this part, we’re going to look at another email authentication technology: DMARC. We will discuss how dmarc can benefit you, how to create dmarc record and how to interpret dmarc report. DMARC stands for Domain-based message authentication, reporting and conformance. DMARC is not a product. It’s a freely available technical specification and widely supported across the Internet. Anyone owning a domain name can take advantage of DMARC. A DMARC policy allows a domain owner to indicate that emails from his/her domain is protected by SPF and DKIM. You can use DMARC to discover all legitimate sources of email. DMARC builds upon two existing technologies: SPF and DKIM. Fraud detection: Phishers often spoof the From: header address to impersonate big brands. DMARC is a powerful tool to fight against email phishing and thus protect your brand. Simplified email delivery: Sending DMARC-compliant email allows receiving email servers to simplify filtering rules. Your email domain reputation can be improved after you create DMARC record correctly. Gives senders visibility into how receiving email servers process their email. You can get a report of how many legitimate emails are sent from your domain, how many emails can’t be authenticated including both legitimate and fraudulent ones. This is a pretty big deal to any organization that relies on email for its day-to-day business. If you are doing email marketing, then DMARC is a must have tool to make email easy to deliver and reach customers. Pretty much every major consumer-facing mailbox provider like Gmail, yahoo and Microsoft ask to be sent DMARC-compliant email to make their job of filtering emails easier. 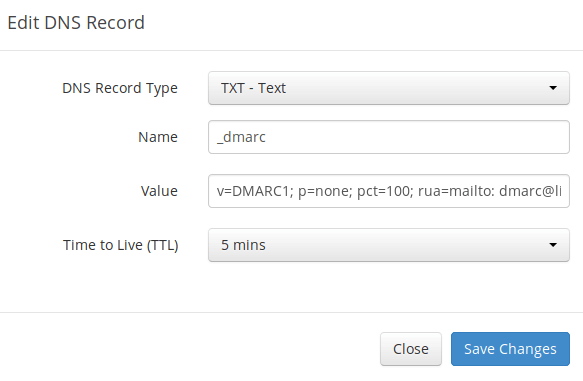 DMARC policies are published as a TXT record in DNS. 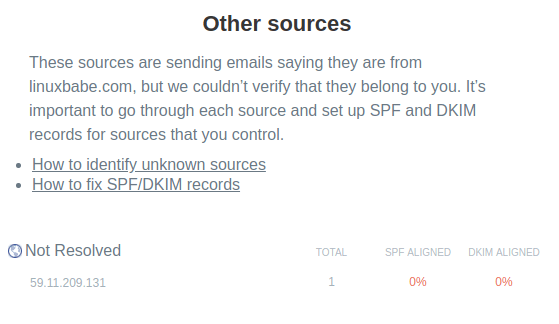 To create DMARC record, you must make sure your already have set up SPF and DKIM records. Send a test email from your domain, then check the raw email. You want to make sure the domains in Return Path, From: header and d=domain in the DKIM signature are the same. If the 3 domains are identical, then they are aligned. If Return-Path or DKIM d= uses a subdomain instead of the main domain name, then this is called relaxed alignment. If no subdomain is used and the main domain names are the same, then it’s called strict alignment. v=MARC1: The protocol version is DMARC1. p=none: We choose none as the policy for our domain. rua stands for reporting URI for aggregate report. The email address is used to tell receiving email servers where report should be sent. Replace [email protected] with your real email address that are used to receive aggregate DMARC report. none: tells receiving email servers not to do anything special if DMARC check fails. quarantine: tells receiving email server to put the email into spam folder if DMARC check fails. p=none is a good start. You should analyze the data for some time. Once you have enough data, you can change the policy from none to quarantine or reject. There’s another tag that you can add to the DMARC record: fo. It has four possible values. 1: generate reports if any mechanisms fail. I recommend using fo:1 first to generate more comprehensive DMARC failure reports. When you change to a more restrictive policy, use fo:0. 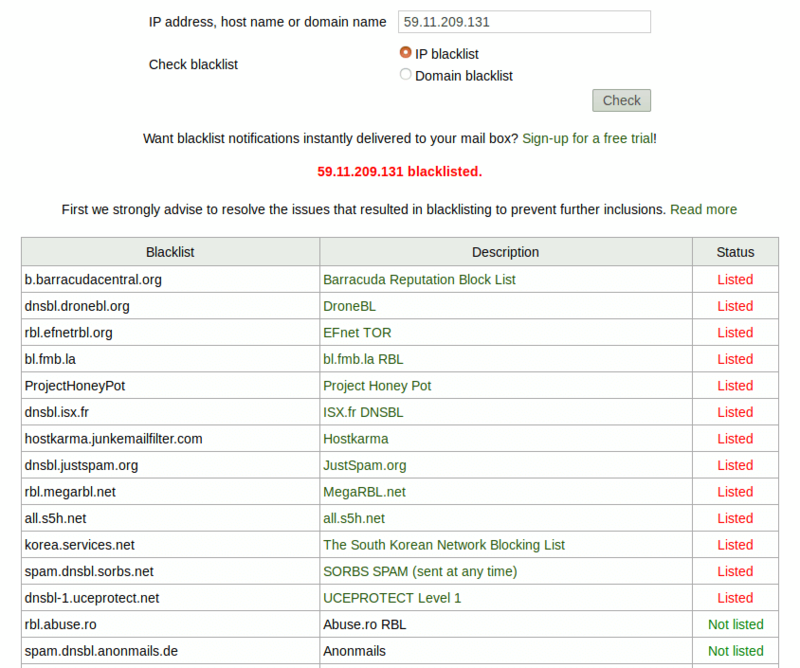 You can see that I used two email addresses to receive DMARC report, which I will explain later. There’s another command line tool (opendmarc-check) that you can use to check DMARC record. It’s provided by the opendmarc package. opendmarc-check queries the DNS for a DMARC record for the named domain and then translates the content found to a human-readable form. If you have a domain name that’s not going to send emails, you should use p=reject policy. A good service for DMARC test is https://www.mail-tester.com. Go to the website, you will see a unique email address. Send an email from your domain to this address and then check your score. (This website check all factors that affect email deliverability, not just DMARC.) If DMARC passes, then you will see something like below in the test result. To pass DMARC check, your emails need to meet one of the following requirements. SPF pass and the Return Path domain name is the same as the From header domain. DKIM pass and the d= domain in DKIM signature is the same as the From header domain. By default, DMARC uses relaxed alignment. So the Return Path domain or the d= domain in DKIM signature can be a subdomain. There are two kinds of DMARC reports. Daily XML-based aggregate report generated by Gmail, Yahoo, Hotmail, etc. Normally you only want to receive the aggregate report. The data that DMARC produces is invaluable for understanding what is going on for any given email domain. However, raw DMARC report data is super hard to read and understand. Luckily, Postmark offers a free service to process these reports, presents you a much more readable report. The nice part about Postmark is that you can tell receiving email servers to send XML reports directly to Postmark for processing. So instead of entering your email address in the DMARC record, you enter an email address of postmarkapp.com that is unique to you. You can also specify multiple email addresses, separated by comma. After your DMARC record has been verified by Postmark, you will receive DMARC report weekly on every Monday in your email inbox. You don’t need to register an account at Postmark. Below is my first weekly report sent from Postmark. mcsignup.com belongs to MailChimp, which is what I use to send newsletters to my mailing list. In my SPF record, I actually allows MailChimp to send emails on behalf of me, but I didn’t know that they don’t use my domain name in the Return-Path header for the signup confirmation emails. And they don’t sign emails using my DKIM domain. What surprises me more is that 42.8% of emails sent from my own email server (74.207.252.70) failed SPF alignment. 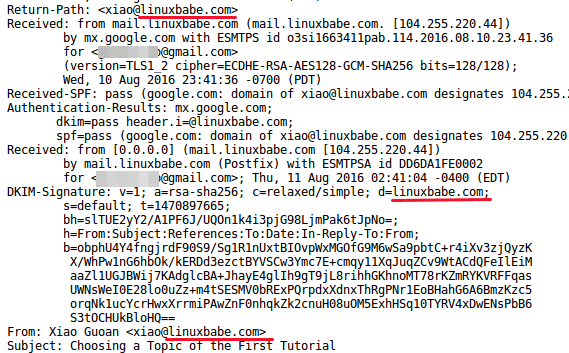 There’s also an unknown source that claims to be linuxbabe.com. First, I always treat IP address that doesn’t have reverse DNS record as spam. Then, to identify other unknown source, I will check if it’s on an email blacklist. debouncer.com tells me that it’s on 13 blacklists. So clearly it’s a spammer trying to impersonate my domain name. To better understand the unknown source and how your domains are used, you can choose to receive forensic report by adding the ruf tag in DMARC record like below. The forensic report contains the copies of emails that failed DMARC check. You can see the email headers, subject lines and sometimes message body to determine the nature of failed emails. If you recognize the subject line, then it’s more likely to be a forwarded message. Note that some email servers may choose to generate aggregate report but not forensic report due to privacy concerns and others may only include emails headers in the forensic report. When does SPF or DKIM Fail? Typical example of SPF failure is when your emails are relayed to the destination email server through a third-party server. And the common situation where DKIM fails is when your emails are sent through a mailing list, which often adds additional headers or sentences to your emails. Actually, mailing list can cause SPF failure too. There are two kinds of mailing list. Announcement mailing list. Typically used by websites to send newsletters. The mailing list owner can send messages to large number of subscribers, whereas subscribers can only reply to the mailing list owner. Discussion mailing list, where subscribers can send messages to all other subscribers. This is common in the open source community. GNU mailman is the most popular software to set up such mailing list. This first kind is easy to tackle, because the domain owner is a customer of the mailing list server provider. It’s easy to add the mailing list server to SPF record. Also, the mailing listing server can do DKIM signing for customers. The second kind of mailing list is difficult to tackle for domain owners who has users participating discussions in various mailing lists. The domain owner can’t list all possible discussion mailing list servers in SPF record, and these mailing lists can’t do DKIM signing for other domain names. A possible solution is that the mailing list uses its own address in the From: header, and adds the original email sender’s address in the Reply-To: header. More details can be found on this GNU mailman wiki page. A more practical and promising solution is ARC (Authentication Received Chain), which basically means that mailing lists do DMARC check and sign the DMARC result. Receiving email servers can trust the ARC signature and override local DMARC check results. You should wait enough time to receive lots of DMARC report. Don’t be surprised when you see false positives in your DMARC report. Analyze these false positives and take action to make sure they can pass DMARC check. After that, switch your DMARC policy to p=quarantine and eventually p=reject. Do not skip quarantine and go straight to reject. When you switch to a more strict DMARC policy, consider changing the value of pct tag. Why I’m still using p=none policy? Firstly, it’s because of Microsoft. mails forwarded from Microsoft Outlook Mailbox can fail DKIM check, which is bad. For this reason, I cannot set my DMARC policy to quarantine or reject. Another reason is that I’m using MailChimp to send newsletter to my email subscribers. 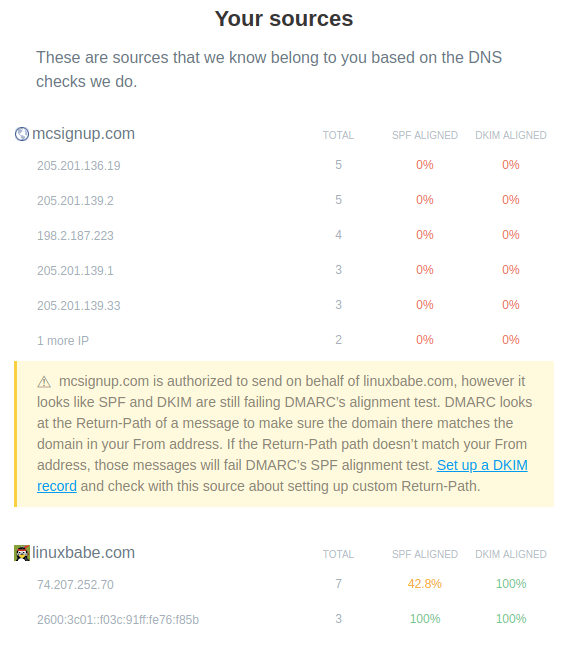 MailChimp uses its own domain in the Return-Path header and its own DKIM signature for the signup confirmation email, which causes DMARC failure. The solution to the first problem is delopying ARC (Authenticated Received Chain). Until ARC is implemented on Mailbox providers, I won’t change my DMARC policy. To solve the second problem, I need to switch to a self-hosted newsletter app like Mailtrain, instead of using a email service provider (ESP) to send newsletter to email subscribers. That way, I can use my own domain name in the Return-Path header and my own DKIM signature in every email. However, this also means I will need to build a good reputation for my email domain and the IP address of my email server, so that my emails can land in my subscribers’ inbox instead of spam folder. That can take quite some time and effort. DKIM alignment in emails forwarded by Microsoft Outlook has improved. Also in February 2019, Mailchimp started using customer’s domain name in the DKIM signature for the signup confirmation emails, so all Mailchimp emails are now DKIM-aligned. I now begin experimenting with the p=quarantine policy and eventually will switch to the p=reject policy. Having a p=none policy is better than having no DMARC record. Although p=none cannot prevent email spoofing, at least my legitimate emails have better chance to be placed in inbox. That’s it! In part 5, I will show you 6 effective tips to block email spam with Postifx. As always, if you found this post useful, subscribe to our free newsletter or follow us on Google+, Twitter or like our Facebook page. Love the way you write tutorials!